My mare Allegra Bint Djammal had a lovely colt at 2am this morning (sire Prince Psyche). I am over the moon (and just a bit tired as I still had to do a full day at work today!) Here are a few pics taken at about 5 hours old. Huge thanks to Georgia for selling Allegra, and to Jane for doing all the hard work foaling! He is adorable! Thank goodness it's the weekend so you can spend hours looking at him interupted! Congratulations absolutly stunning. My friend has your boys half brother (i think he has a different sire) and if he is like him (which im sure he is) he has a great future in the show ring !Well worth the tired day i bet, you can get some sleep now, although i bet lots of time will be spent just looking at him. I have been busy with my camera again! Here a couple from this morning of him enjoying the sunshine! Thanks for all your lovely messages! What a lovely little boy - congratulations !! 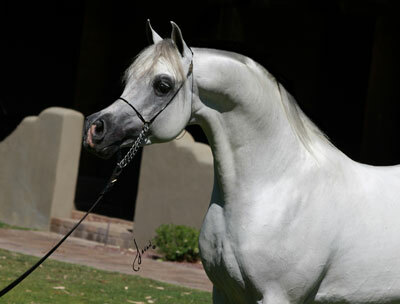 I have a fabulous mare out of Casablanca bint Djammal (by Azteq). Are Allegra and Cas full sisters? JuliaB, yes Casablanca and Allegra are full sisters. What a gorgeous baby....those eyes are to die for! Lynda, Om El Bashaan is stunning, no wonder he took your breathe away when you saw him. I am a huge fan of Carmargue lines. I have a four year old gelding who is double Carmargue and I never tire of looking at him. Every day I tell him how handsome he is - although I think he knows it - he shows off all the time! I have sent you a PM - I need to pick your brains!